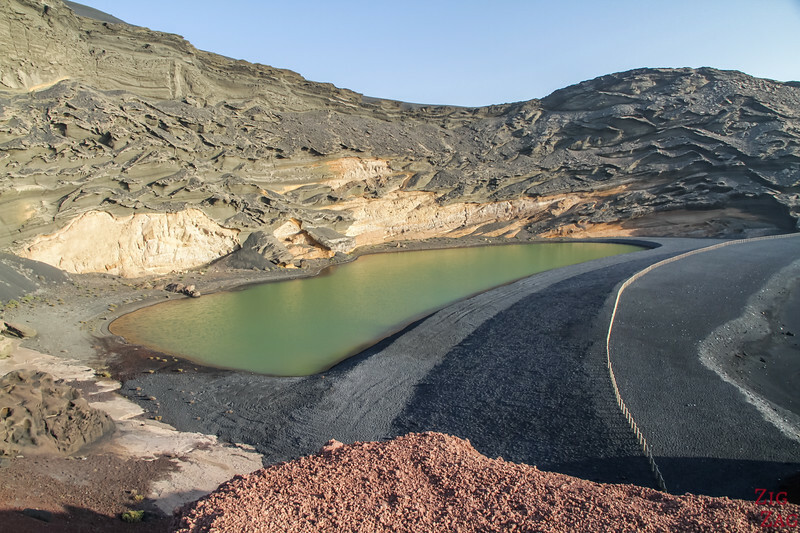 Let's discover the unique volcanic landscape of the Green lagoon Lanzarote at El Golfo. 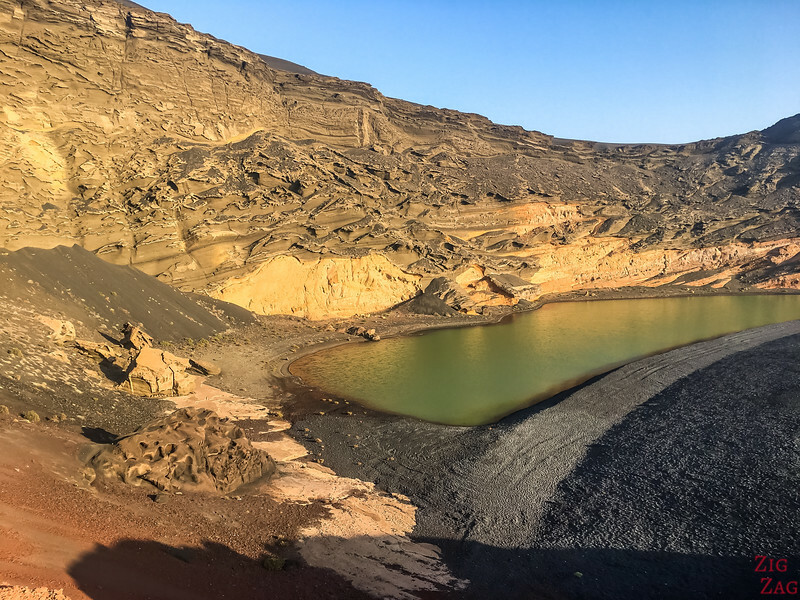 Also known as Lago verde or Charco de los Clicos, it is a world of colourful contrasts and strange shapes: a Green lake, black and red rocks and the blue sky! Below is my guide to help you plan your visit. 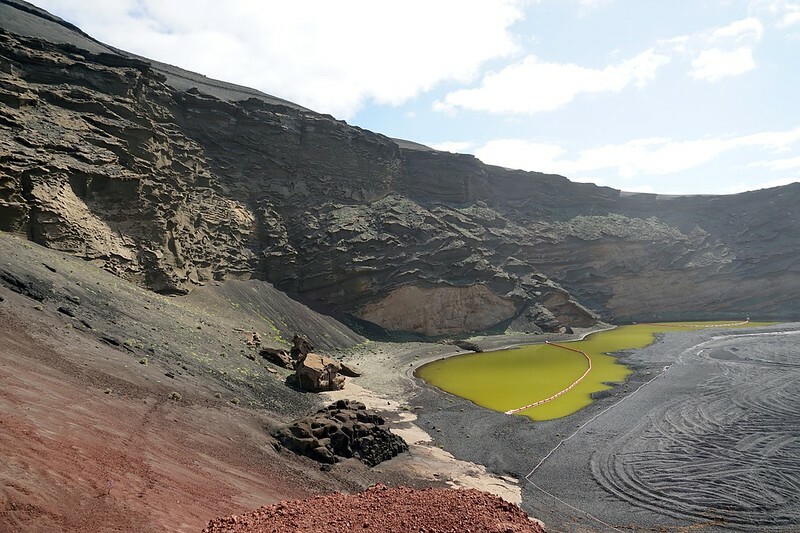 Why Visit the Green Lagoon Lanzarote ? 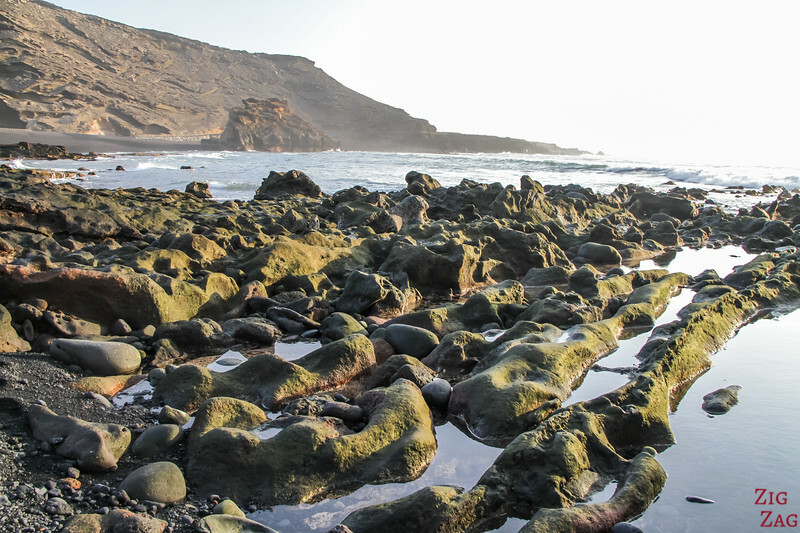 ​​​​​Charco Verde: A unique landscape! On my way to Charco verde, all I was expecting was to see a green lagoon. But what remains of the volcano behind is also stunning. 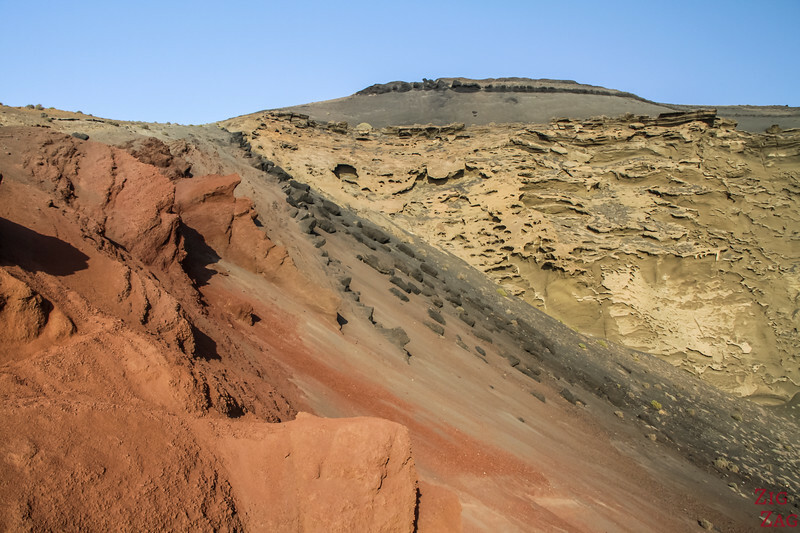 There is a mix of red, yellow and black rocks which have been beautifully shaped by erosion. Plus all that is combined with a black beach and a practical viewpoint. 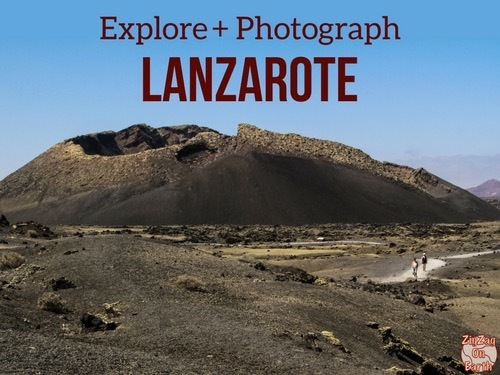 A great short stop and one of the great things to do in Lanzarote. 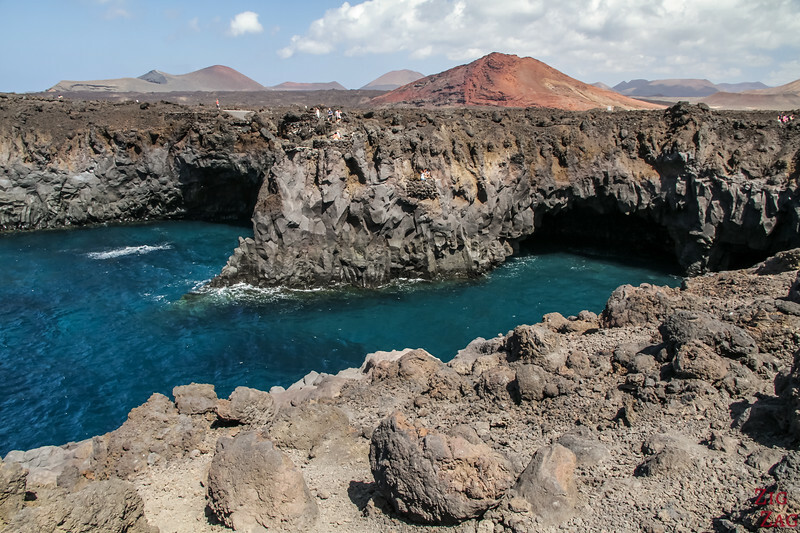 The volcanic crater was formed during the 1730s eruptions and it was flooded by the ocean. With erosion, only half of the cone remains. 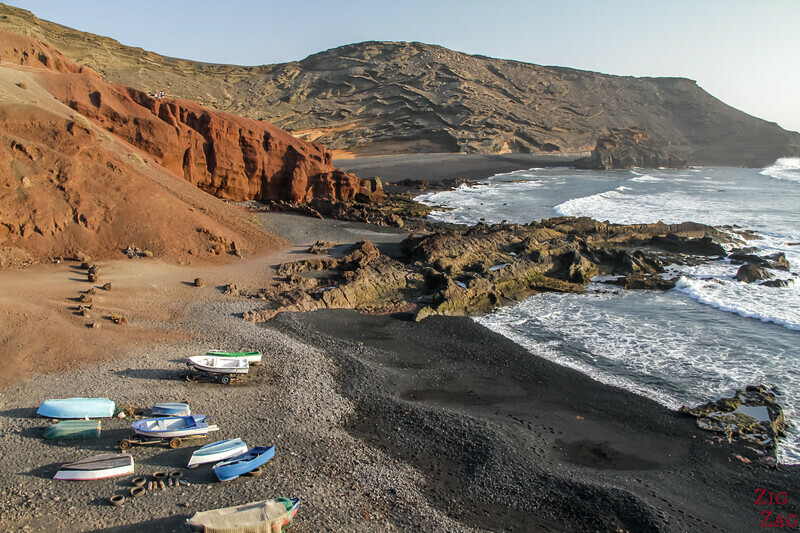 On the other side of the parking is the small fishing village of El Golfo, which is why the green lagoon is sometimes referred to as El Golfo. North access only. The South access (road/carpark) has been closed. 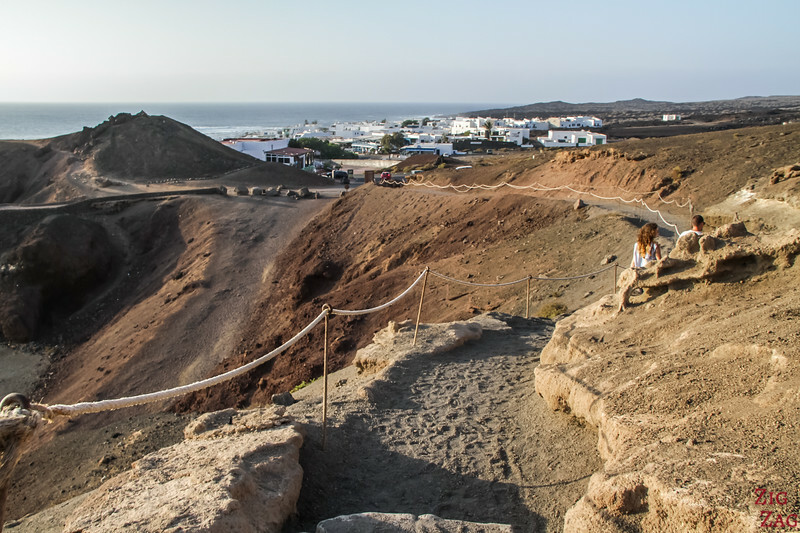 In the photo below, you can see the village of El Golfo in the background. 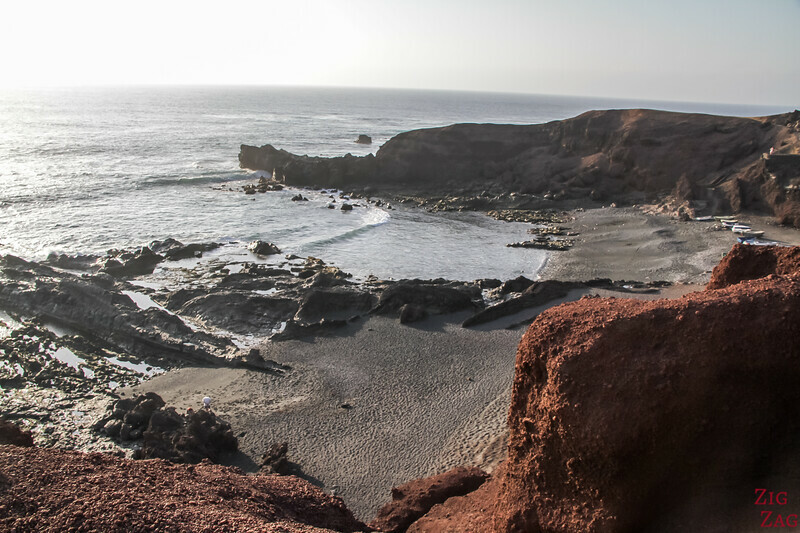 For more ideas of where to stay in Lanzarote, head to my complete guide. 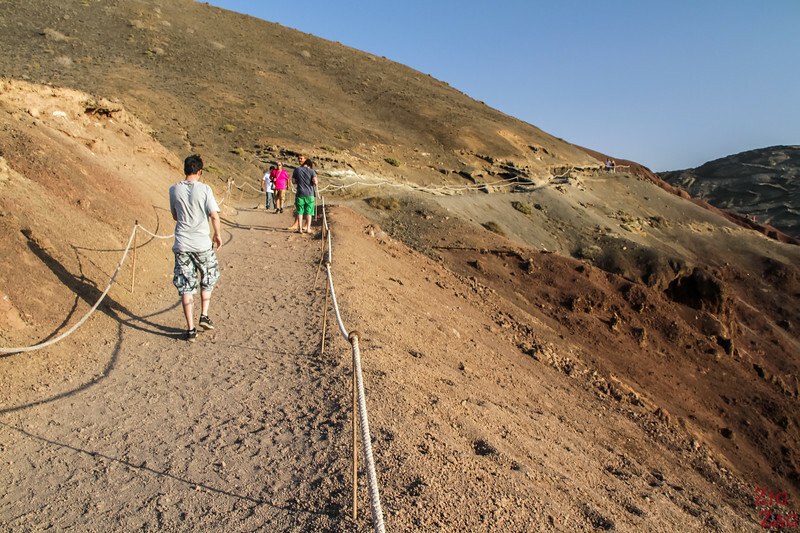 To access the viewpoint over the volcano and Lago verde, it is a short 5 min walk on a maintained path. It is an easy access, just be careful with young kids. 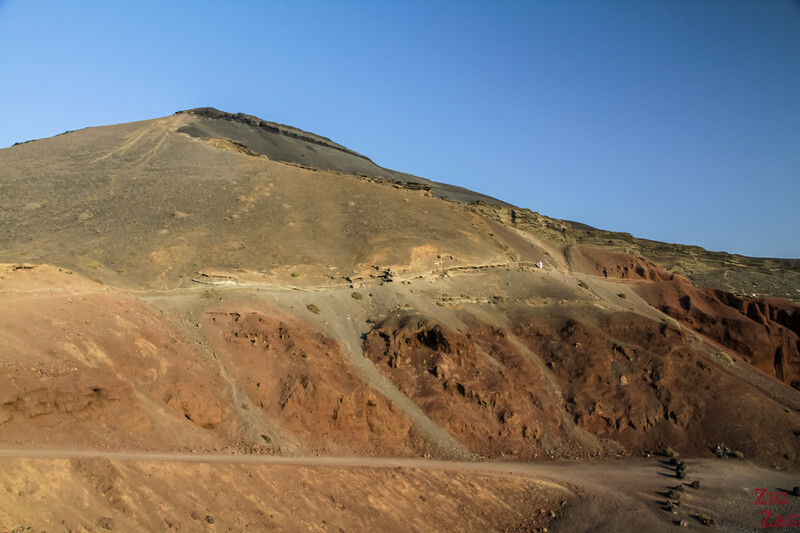 At the end is a viewing platform on the red part of the volcano. 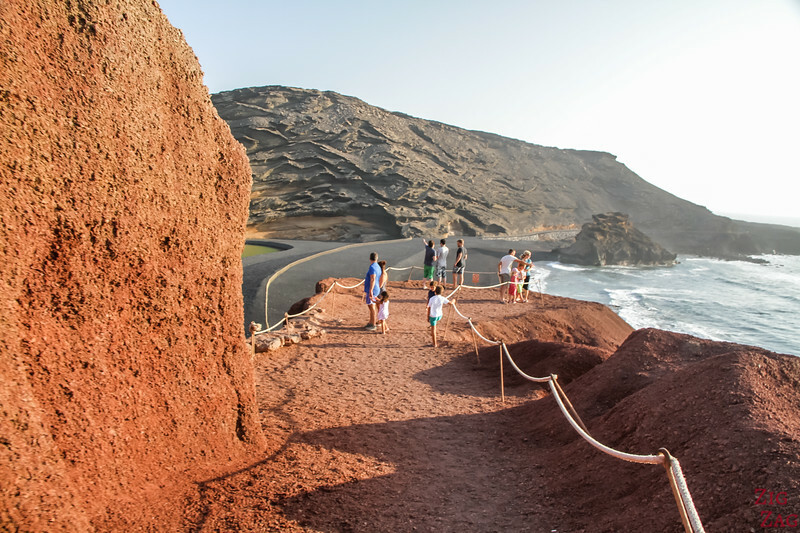 You get a complete view of the caldera, the lagoon, the beach and the ocean. Below, are my pictures to give you an idea of the views from that platform. As I said because the volcano was formed by the water, the rock is porous. So overtime, erosion has created beautiful shapes, like waves of rocks. At the bottom is the famous green lagoon Lanzarote. It really stands out against darkness of the beach. 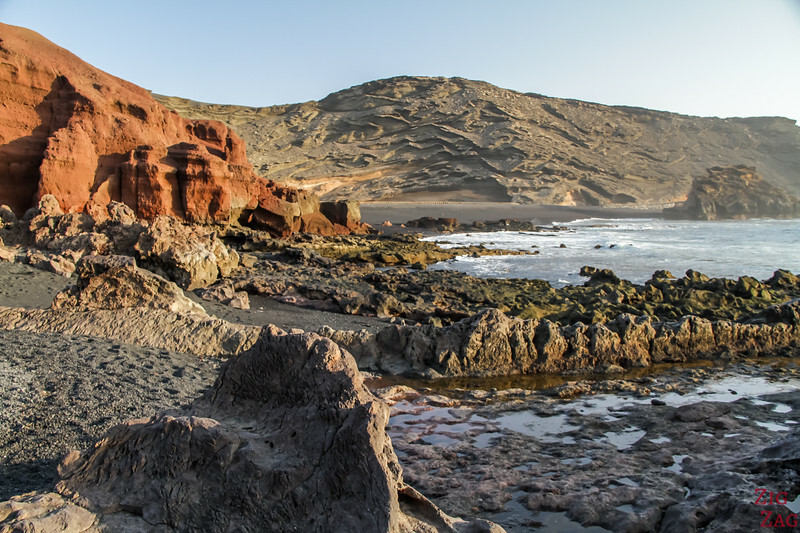 It creates one of the most beautiful beaches in Lanzarote. The Laguna Verde is roughly 150m long. It used to be bigger. According to this site, it is denser and saltier than the Dead Sea. It is protected and you can't approach it. But because my favorite colour is red, I really enjoyed the North side of the volcano, right by the viewpoint. The walls are intense red and there are strange black rocks stuck on the side. It is fascinating. 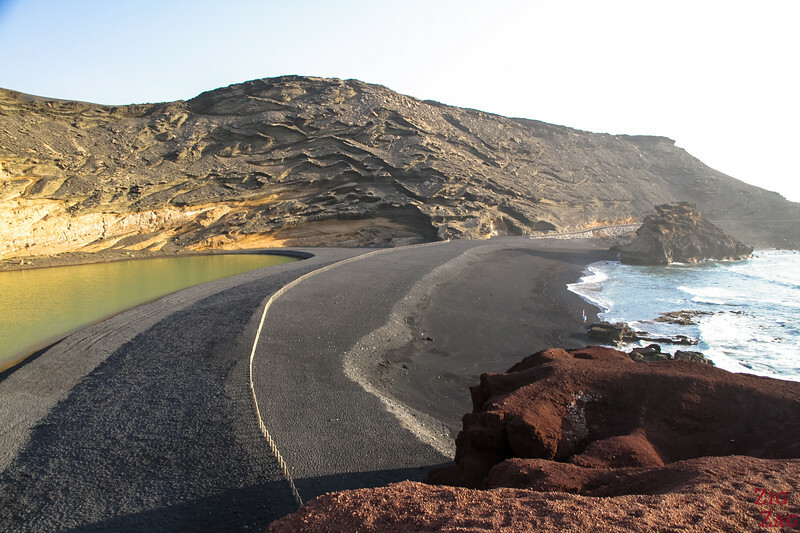 Between the Lagoon and the ocean is a 30m wide black beach. It is made of volcanic sand, pebbles and it contains olivine a semiprecious stone of olive colour. And notice the lava chimney at the end of the beach. Depending on the light and conditions, the lagoon can appear more or less green. However picture where you see it completely neon green have been heavily post-processed. I also really enjoyed the small cove, below the access path to the viewpoint. Below is a view from the carpark side. You can see the different types of rocks and colour. It used to be a fishing village, and there are many great seafood restaurant for you to enjoy. It is easy to get down to the beach and sit to enjoy sunset. I really enjoyed the rock formations and the play with water. It was pretty quiet at this hour. 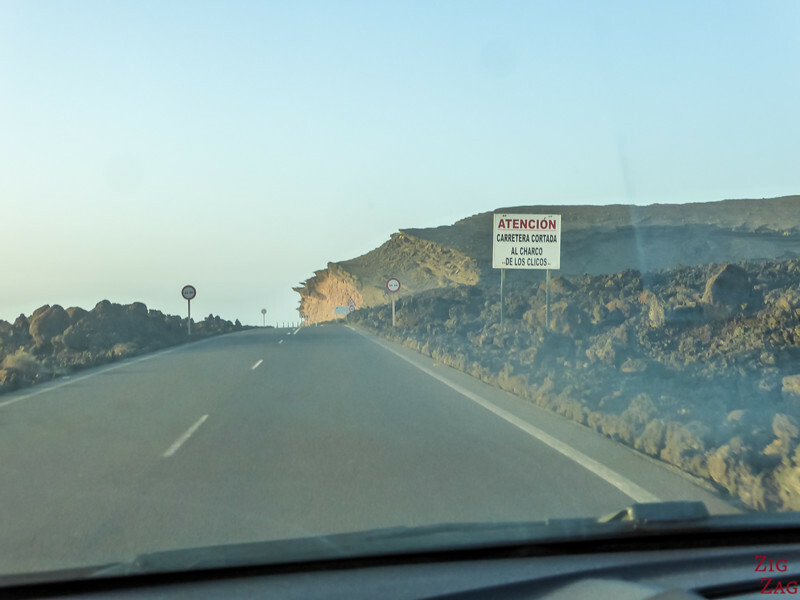 Note that there used to be an access to the beach via the South end (when driving from Los Hervideros), but it is now closed because the cliffs are not stable and it has become dangerous. You can combine your excursion with a visit to the cliffs of Los Hervideros. 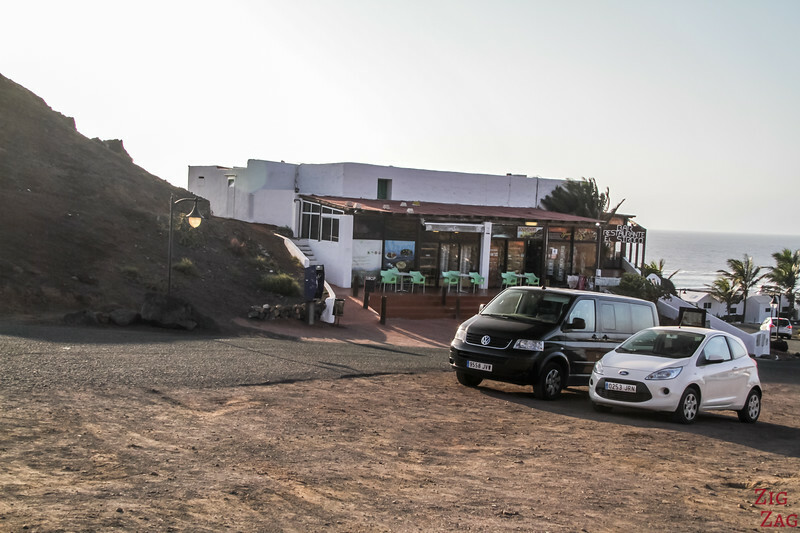 This is one of of my favorite places in Lanzarote. However if you have time, I recommend coming twice, because the Green Lagoon is better at low tide, while Los Hervideros is better at high tide.